The Warwick, 7.2 – Erratic service, warm white wine and mismatched, uncomfortable furniture: so why did I rate the Warwick so highly? Read the review here and find out. 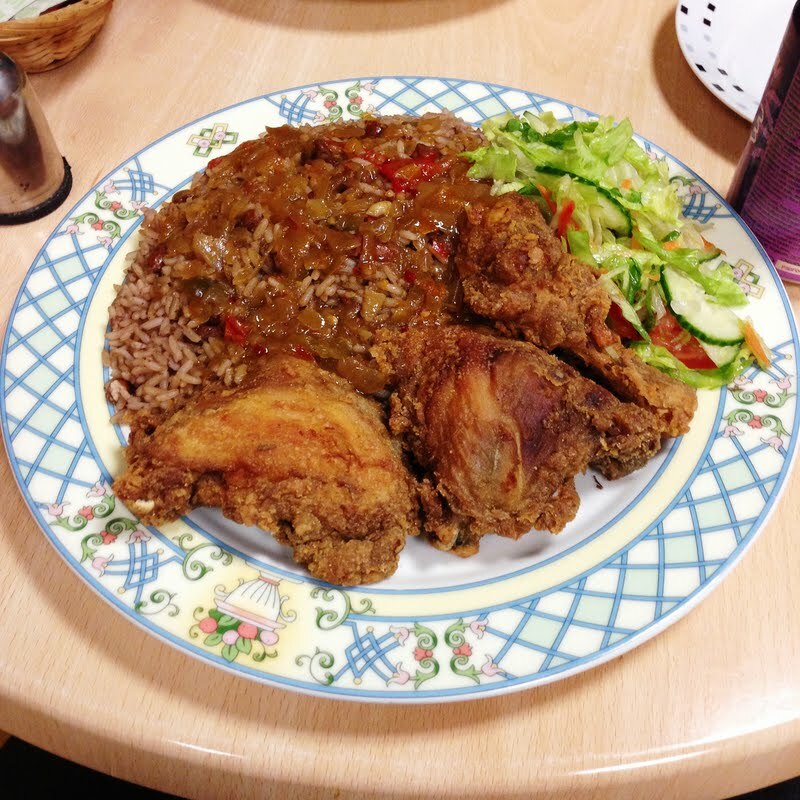 Perry’s, 6.7 – I’ve always shied away from going into Reading’s only town centre Caribbean restaurant, mainly because I’m too chicken. Go here to find out what I’ve been missing all these years. Kyklos, 6.3 – Is it possible to have a bad meal in a good restaurant? I’m still not sure, but Kyklos is the place that made me think about it an awful lot. The review (which contains almost no garlic whatsoever) is here. It’s also been a busy month in terms of restaurant news. Signs have gone up on the ground floor of Kings Walk heralding the imminent (or possibly eventual) arrival of La Courbe, which is going to be a combination of a Lebanese restaurant and a wine bar. From the looks of it, and it’s hard to make out much behind the hoarding, the wine bar might be bigger than the restaurant. This could be good news – Reading only has one Lebanese restaurant, Al Tarboush, which isn’t exactly in the centre of town. The wine bar is also promising, as anybody who’s enjoyed a Lebanese red probably already knows (Chateau Musar, anyone?) However, it looks like a big site and the ground floor of Kings Walk has had a steady churn of businesses over the years that have failed to make a go of that spot. Let’s see if Le Courbe (which I think translates as “the curve” – I’m sure they have their reasons) does any better. Also near that end of town, Bhel Puri House has opened in Yield Hall Lane, the alleyway down the side of the Oracle, off Gun Street, and seems to have taken space which used to belong to the ill-fated Dickens Brasserie (although there’s still a menu for Dickens Brasserie out on the street, so goodness only knows what’s going on there). It promises vegetarian Indian street food and is open until 8pm. It seems to be aiming at the lunchtime market – which can only be a good thing, because at lunchtime Reading can sometimes feel like a straight-out fight between Picnic and Shed on one hand and the chains on the other. I’ll go and check it out when it’s settled in, and report back. Speaking of Shed, they kicked off a new venture last night. Deutsch Dogs will apparently offer “Authentic German sausages imported from award-winning specialist butchers”, and means Shed will stay open until 9pm. Customers will have the option of taking their sausages away, so to speak, or eating them in Milk, the cocktail bar and rum evangelist upstairs. It’s an interesting move, and it’s definitely a gap in the market, so might be worth checking out. No website, but they have a Twitter feed here and a Facebook page here. Oh, and I’ll tell you this for nothing: writing this paragraph without doing any puns based around the word “wurst” may be one of the most difficult things I’ve ever done. The other end of Broad Street is also getting a new restaurant. Original Buffalo Grill‘s website suggests that it will offer some take on the dirty American food which has so transfixed London for the last couple of years – chicken, ribs, burgers etc. From the look of it, it will have some seating, though it’s not clear quite how much or whether most of the trade will be takeaway. The surroundings, two doors down from China Palace, aren’t the most inspiring but let’s see what it’s like when it opens (if it opens – it doesn’t look like a hive of activity there, not at the moment anyway). I have to say, though, that I don’t think it is the original Buffalo Grill. I did a quick search on Google and found loads of places called Buffalo Grill, all of which are already trading; I reckon they’re fibbing. In other news, it’s good to see that Edible Reading is continuing to inspire the Reading Post to up its game and write mildly critical restaurant reviews. They went to Five Guys (a few weeks after I did) and were not one hundred per cent impressed – you can read the review here. It’s not all bad news for Five Guys though, because our local MP Rob Wilson is apparently a fan. You can read glowing coverage of his visit – also in the Reading Post as it happens – here. Last of all, thanks to everyone who keeps suggesting places for me to review; all three of the reviews above were requested by readers of the blog. The list keeps getting longer, and recent requests include Furama, Piwnica Pub, The Spice Oven and Pau Brasil. If there’s somewhere you love that you want other people to enjoy, or somewhere you’ve always wanted to go but aren’t sure about, drop me a line, leave a comment or let me know on Twitter. I won’t charge you a penny if it turns out to be crap. Promise. N.B. Kyklos closed in January 2014. I’ve left the review up for posterity. One thing I’ve learned so far in my – admittedly limited – experience of reviewing restaurants is that some reviews are easier to write than others. Let’s say, for example, that I have a good meal in a good restaurant (or a restaurant that I think is good, anyway). To some extent that review writes itself, and my main worry is doing it justice so that you’ll think it sounds good and hopefully want to eat there yourself. Going to a bad restaurant and having a bad meal also makes for an easy review – less fun to eat, but more fun to write and often more enjoyable to read. But the tricky one is when you go to a restaurant that, in so many ways, is “good” – the room, the service, the little touches – but the food just isn’t up to scratch. But hold on – isn’t a good restaurant a place that serves you good food and a bad restaurant one that serves you bad food? Is it possible to have a bad meal in a good restaurant? All very Carrie Bradshaw I know, and perhaps I’m showing my cards too soon, but I’ve been thinking about this a lot this week because of my visit to Kyklos. So many things about it work, it should be a good restaurant on paper, but the food doesn’t quite live up to expectations. I’ve been to Kyklos a few times since it opened. It’s in that spot that’s a bit of an elephant’s graveyard for restaurants, above Burger King in King’s Walk, having at various times been Topo Gigio, Mari E Monti and the Himalayan Momo House. They’ve done a nice job on refurbishing it; it used to be quite a sterile, unappealing space but looks much better now with smart white walls and very fetching white shutters overlooking the Walk itself. The long, thin room has been broken up (with some lit glass partitions with an olive motif which are, I’ve discovered, surprisingly hard to describe) so it doesn’t have the chilly air that its predecessors had, and the bar area at the front has some welcoming seating for those waiting for a table. The greeting at the entrance is incredibly warm – I’ve only been a couple of times, and not for a while, but I was welcomed by the waitress as if I was a friend rather than a customer. This was definitely the shape of things to come, too; Kyklos does service very well. Sitting down we were given three menus; food with a wine list on the back, a set meze menu and a short Greek wine list – three whites, three reds, nothing over twenty-five pounds. This was a bit of a disappointment in itself, actually; Greek wine can be very good and is much underrated, and I was hoping central Reading’s only Greek restaurant might do more to show that off. On a recommendation from the waiter we ordered a bottle of Greek white, a Malagouzia which I’d never heard of, let alone tried. We couldn’t decide who should taste it so the waiter poured a little for each of us, which was a nice gesture. Their range of Greek wines may be a bit narrow, but this was gorgeous – fresh, light, floral, not too dry (very dry whites have never really done it for me) and good value at £23. Our starters, a selection of meze, were the first indication that we might be about to have a middling meal in a good restaurant. Houmous was very tasty – often they have a strong smoky taste or are pungent with garlic, but this one was rich with tahini and somehow tasted lighter and cleaner. The pitta, though, was stingy – one warmed pitta slices into triangles, drizzled with oil and sprinkled with herbs. Loading all that houmous onto a single pitta was a challenge, although of course we managed it – heaven forbid that anything went to waste. Salted cod in beer batter with skordalia was equally frustrating and inconsistent. The batter on the three fingers of fish was light and perfectly done, but the flesh underneath was uncomfortably chewy. The skordalia was plain disappointing; it’s meant to be the kind of garlic mashed potato that can make enemies on public transport the following morning, but this was a lumpy school dinner effort and finding garlic in it was completely beyond me. 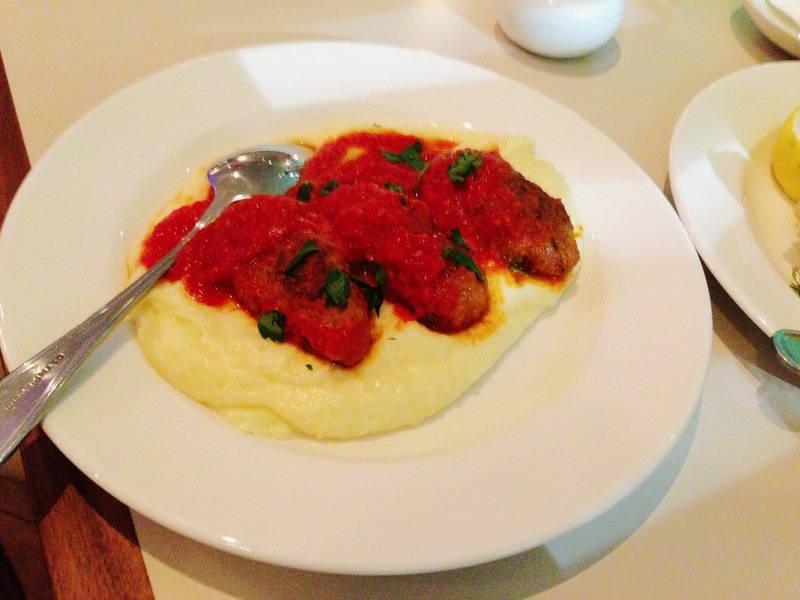 The best of the bunch was the soutzoukakia – beef and lamb meatballs with aromatic mash and cinnamon oil. These were lovely – coarse without being bouncy, three generous meatballs in rich tomato sauce on a bed of gorgeous, smooth mash. I couldn’t quite believe that the same kitchen could dish up two such different examples of mashed potato, but the one that came with the meatballs was far superior, if a little runny (dishing up was fun, put it that way). The flavours, though, were great – and the hint of cinnamon in a savoury dish, so often a feature of Greek food, worked beautifully. The mains were further evidence of an inconsistent kitchen that was either terrified of, or had run out of, garlic. We went for the chargrilled whole sea bass with French fries and aioli, mainly because I’d had plenty of grilled fish on holiday in Greece at the start of the year, and wanted to relive happy memories from what felt like a lifetime ago. It arrived whole – which was my choice, although I did have the option for the kitchen to fillet it – and was underwhelming. Grilled fish on holiday is a wonderful thing partly because of the crispy skin; almost burnt but not quite, beautifully salty, dressed with lemon and oil. This however didn’t look like it had gone anywhere near a grill – it looked baked at best, and the skin was soft and slippery. Once I’d filleted it there wasn’t much left – and I’m no slouch at filleting, even if I do say so myself. The starters at Kyklos are quite big so this wasn’t the tragedy it could have been, but the fact remained that this dish cost sixteen pounds and felt like very little fish for the money. The French fries were also false advertising, being nothing of the kind – they were very respectable chunky chips, the right blend of crunchy and fluffy – but they weren’t what I was expecting. I was hoping to have a sheaf of skinny crispy fries to dip in my rich aioli, and I didn’t get that. And, as you can probably guess by now, I didn’t get aioli either. It didn’t taste remotely of garlic – if anything, what I got was tarragon which wouldn’t have gone with the fish at all. 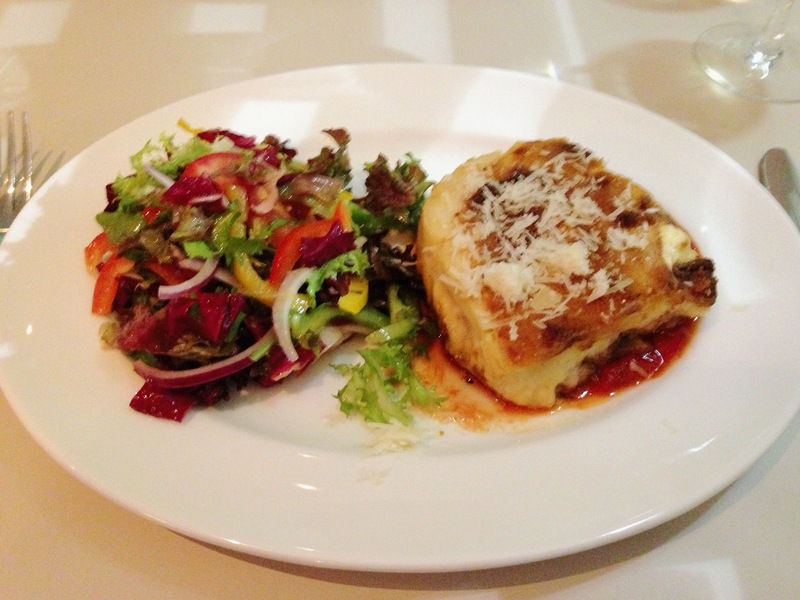 The other main, the moussaka, was a generous slab of béchamel sauce with a distinctly ungenerous layer of meat, aubergine and potatoes at the bottom. My photo isn’t brilliant, but it gives you a good idea just how much béchamel we’re talking about. For twelve pounds, or indeed for less, I would have liked a smaller slab of béchamel sauce with a more generous layer of meat, aubergine and potatoes at the bottom. It tasted nice enough but my companion said that towards the end he felt as if he was eating it for no reason other than stubbornness, and that’s never good. The “feta mousse” which was meant to accompany it, as promised on the menu, failed to appear; perhaps it too was supposed to contain garlic. Between us we only had room for one dessert. I asked the waitress to help me pick between the panna cotta with rose water (which I thought might be quite light) and the walnut cake (which I thought would be quite Greek). She instead recommended the vanilla custard in filo pastry with cinnamon and mango ice cream as it’s home made in the restaurant. What this means for the other desserts, I don’t know but I’m easily led so I accepted her suggestion. This was a good plan, as it turned out. The dessert is known as galaktoboureko in Greece, though I’ve never found it outside of Crete, and it’s delicious; layers of filo pastry filled with smooth semolina custard with a light syrup poured over the top (similar to how baklava is served), all warm and inviting. The curl of ice cream on the side, on the other hand, was completely superfluous and didn’t taste of cinnamon at all, just mango. I think, on reflection, that the dessert I had is representative of Kyklos as a whole. The core elements are really good: an attractive room, excellent, friendly service, some delicious ingredients and some authentic Greek flavours. But some things miss the mark completely: the flaccid fish, the lumpy mash, the lack of garlic in the skordalia or seemingly anywhere else, the pointless ice cream. I kept thinking if only: if only I’d ordered different dishes, the kleftiko perhaps, or the octopus stew with chick peas. But if it’s a good restaurant, it shouldn’t be possible to order badly – right? So all in all, I’ve found this a difficult review to write. I want Kyklos to do well; a good Greek restaurant in the middle of town would be a wonderful thing. I really wanted to love it and to score it highly, but on the night I went there were too many let-downs and too many mistakes. You might have a different experience, and I wouldn’t entirely want to discourage you from finding out, but I do want to warn you. I suppose the last thing to add is that Kyklos is not a cheap place: our total bill was £75 for three starters, two mains, one bottle of wine and one dessert. I know I could go to Kyrenia in Caversham for the same money and have a considerably better meal. But then that’s a different review. Today’s restaurant has no website, almost no reviews anywhere, and even if you walked right past it you could be forgiven for not knowing it exists. And yet Perry’s, the Caribbean restaurant next to the Oxfam Bookshop on Market Place, has been there for a very long time. Shamefully, the reason I’ve never eaten there isn’t that I hadn’t noticed it, even though that would be understandable. I notice restaurants wherever I go, like a sixth sense, and when I do I always have to wander over and read the menu. No, I knew all about Perry’s, and I avoided it because every time I’ve been outside, I’ve looked through the window and felt intimidated. It’s a funny balance, isn’t it? If you see a Chinese restaurant full of Chinese people (like China Palace) or an Indian restaurant full of Indian people (like Chennai Dosa), it’s unmistakeably promising, but only up to a point. Beyond that, and maybe it’s just me, it starts to feel like you aren’t meant to be there, like you wouldn’t fit in. It conjures up images of that famous scene in An American Werewolf In London, or some of the pubs I was warned not to enter during my first year at university. So I’m a little embarrassed to admit that, like countless people in Reading, I too have walked past Perry’s without going in, hundreds of times – not because it didn’t appeal, but because I was too chicken. Edible Reading has changed all that for me – I suppose I partly see it as my duty to go to lots of new, different places, and sometimes that involves leaving my comfort zone. The review requests that people send are all taken seriously, so my friend and I found ourselves in Perry’s this week for an early evening meal – although, as I discovered, I suspect that eating in Perry’s in the evening is slightly missing the point. The menu on the front door is slightly misleading. It lists a number of Caribbean dishes (salt fish and ackee, curried mutton, barbecued chicken, brown chicken stew, rice and peas, macaroni pie, I could go on – and I’m half tempted to given that they don’t have a website) but in fact what gets served varies from day to day. We didn’t know this when we arrived but soon figured it out looking at the blackboard next to the counter. It lists all the dishes, but the ones that are still available have a green sticker next to them. Perry’s closes at 8, and when we got there – with just over an hour remaining – there weren’t many green stickers left. Some of them, sadly, weren’t even true: there was no macaroni pie, despite a green sticker to the contrary. I was a bit gutted by this, even though I wasn’t 100% sure what macaroni pie was, because I liked the sound of it. I was assuming – correctly as it turns out – that it’s a bit like macaroni cheese, which would have made it a Good Thing in my book. So, by the time we got to Perry’s it was a fairly straightforward choice: barbecue chicken, fried chicken, fried fish or oxtail, accompanied by either rice and peas or plain rice. The only other choice is whether you have a small or large portion. Perry himself was behind the counter on this occasion and, apart from two other diners, we were the only people in the place. I asked him about the difference between the large and small portions and he waved a medium plate (which is apparently small) and a full sized dinner plate (which is large – and believe me, it was) at us. So, that’s the difference: that and the grand total of an extra quid. The seating at Perry’s is pretty basic – the right side of uncomfortable, but not somewhere you’d settle in for a long meal. The whole thing has the feel of a cafeteria about it, which meant I wasn’t really sure what happened next. Should we wait at the counter? Would we be called up, like at a crappy coffee shop? Would they bring it over? Again, I realised that Perry’s wasn’t quite like most of the restaurants I eat in, and that gave me that little flash of feeling outside my comfort zone again. I wasn’t even sure how long we’d be waiting before our meals arrived. In the end, Perry brought the food over in about ten minutes. The small portion of fried fish was seriously tasty stuff, and really not small at all – a light fried coating on a couple of decent sized chunks of what I think was salted cod. It was a little chewy, and not really crispy, although I don’t know enough to be able to say whether that was down to the time of day or how it had been cooked. The large portion of chicken was also delicious – three pieces of chicken served on the bone, coated in a fine layer of seasoning. Again, it wasn’t crispy and it was slightly on the tough side, and again I can’t tell you if that’s how it should be. I can tell you, though, that we both really liked it, and by the end all the bones were very effectively stripped, a little mass grave on a sideplate. The rice and peas was the revelation, for me: rice cooked in spices, herbs and stock with kidney beans mixed in, with just enough heat to make you blow your nose but not enough to blow your mind. We spent a bit of time trying and failing to work out exactly what was in there – there was definitely some chilli, definitely some thyme (I know that because I had a naked stem tucked in my rice), plenty of onion, but beyond that we weren’t sure. Something had to give it that tangy, almost fruity flavour, but what was it? I still don’t know now, but whatever it was it made the rice so tasty that I even used it to accompany the little fresh salad on the side – iceberg lettuce, tomato and some thinly sliced cucumber. It might not sound significant, but it is: I never eat the token salad garnish. There’s no alcohol licence, so it’s all soft drinks. In our case, it was pineapple soda (because I’ve never tried it before) and grape soda (which I’m told is surprisingly tasty, once you get used to it). We decided to pass on a soft drink called “Bigga” on this occasion, despite all the puerile potential for mirth it would have offered. When we’d finished we weren’t sure what the normal procedure was. Perry was busy in the kitchen – cleaning up, presumably, as no other customers came in while we were in there. Since there were no other customers finishing up there was nobody to copy. In the end we took our plates up to the counter – again, not quite sure if we were in a restaurant or a canteen – and we ended up having our bill totted up by the woman at the other table, who we’d mistakenly thought was another customer (I think that means we may have been their only customers that night). The total for two dishes and two cans of drink was £16, which made me wonder if we’d been undercharged. If you’ve gathered from the previous paragraphs that I still don’t quite know what to make of Perry’s, you would be spot on. 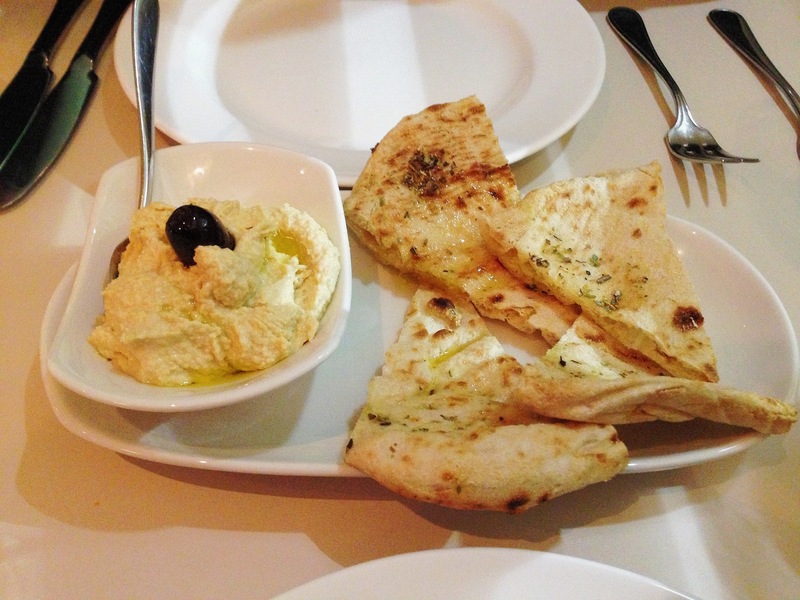 Both dishes were delicious but I couldn’t help feeling that I’d missed the boat by visiting early evening on a weeknight – the range of options was limited and the place was empty, so there was no buzz or chatter. The building used to be a kebab shop, in a previous incarnation, and it still feels like it’s very much a functional place – walk in, get fed, walk out. That said, if you’re in the mood for a quick meal Perry’s could be perfect for you. The food was really tasty, and it’s something you can’t get anywhere else in the centre of Reading. I’m told, too, that grape soda could prove to be quite habit forming. And the service, if basic, was really warm and friendly – when I was pondering what “ground food” (also on the blackboard but bereft of a green sticker) was, the lady at the other table told me in great detail. It turns out that it’s like a savoury doughnut made from yams, and it sounds pretty magnificent to me. All told, I’m glad that I got over my preconceptions (and over the threshold). This would be a sad town indeed if you could walk past an interesting looking restaurant and not go in just because you’re too busy sticking to the tried and tested, and in a way that’s what Edible Reading is all about. So yes, Perry’s isn’t the place for an epic drawn out dinner. It’s not a place for going mad with the wine list, or for that matter drinking at all. It’s not a place, either, where you’re going to have a starter or a dessert. But having said all that, next time I walk past Perry’s on a Saturday lunchtime, when it’s packed with diners and I don’t feel quite so nervous, I think I might just go in. Maybe you should too. N.B. The Warwick reopened as Bali Lounge in Jan/Feb 2015 with a slightly different emphasis and a different, shorter menu. I’ve left the review up for posterity, but I’ve reviewed Bali Lounge here. First the bad news; as much as I wanted to like The Warwick there were a few hurdles to get over. The decor is pleasing to the eye, with lots of Buddhas (is that the plural of Buddha? Buddhae?) and Ganeshes (likewise) dotted about the place. The lighting is muted (you’ll be able to see that from the photos) with fairy lights strung around the windows and signage which give it a romantic feel. Sadly, though, the furniture is an odd mish-mash of things; they’re all in keeping but the variation from hard wooden rustic style chairs (which, worryingly, all sway slightly when pushed) to fully upholstered dining chairs means that there are definitely good and bad places to sit, which means good and bad tables. Actually, I suspect they’re all bad tables, just in different ways: we started at a table where you could see what you were eating, but moved because we were sitting on rock hard yet rickety chairs and I don’t think my bum could have coped with two hours of that. We moved to a different kind of bad table; better chairs, but atmospherically lit at best and, because the table was so low, we struggled to fit our legs under the table. Never mind. We’re British, dagnabbit, so we stayed put. You can ask to move tables once and you get away with it, do it twice and you run the risk of having a foam added to your meal where no foam should be. Another hurdle: I don’t think wine is really the Warwick’s thing. We ordered a bottle of Albarino. The bottle was coated in a fine layer of condensation and the felt cold to the touch but when poured the wine was just not cold enough. This was tricky to explain to the waiting staff who didn’t quite understand what the problem was – not in itself an encouraging sign. A friend of mine reported a similar experience when she ate there recently – which they tried (and failed) to rectify by chucking ice in the wine cooler. Maybe their fridge just isn’t turned up high enough (or low enough, depending on which way you look at it). A second bottle of Albarino felt no colder, so we turned it down and said we’d order a red instead. They were so baffled at why this wasn’t acceptable that I almost felt guilty, even though they were the ones at fault. The red was a bottle of Fleurie – it was okay at twenty-four quid but not exceptional, and it didn’t have quite the light fruitiness I associate with Fleurie. Even ordering this was plain weird – they brought the bottle over, showed it to us and then wandered off to remove the cork out of sight. When it came back, the waitress poured some into my glass. I kept waiting, expectantly, for her to stop so I could taste it, but she just filled it right to the top and then proceeded to fill the other glass. Again, I felt like I was the one who looked stupid, even though I knew I wasn’t. Now comes the good news. The food. 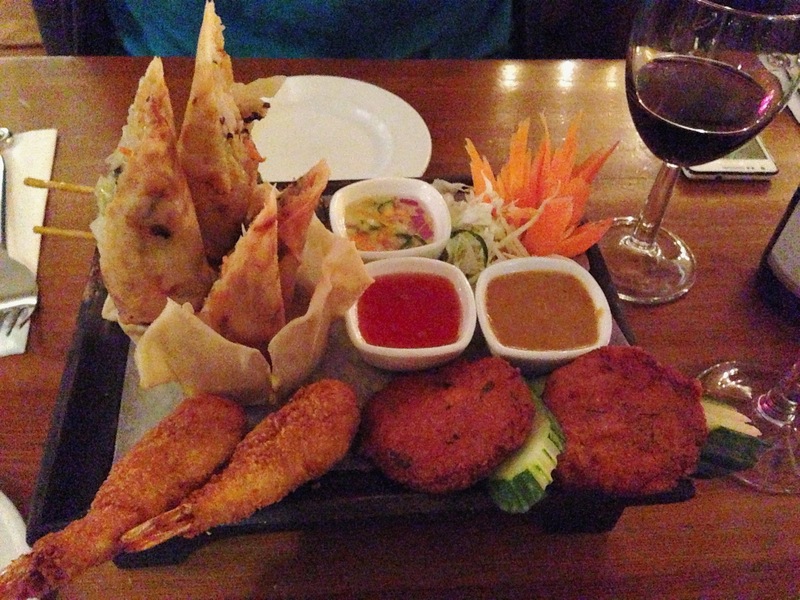 We went for the Island Spice starter platter which is your usual fare – the ubiquitous fish cakes, satay chicken (out of sight in this photo), a breaded prawn and a spring roll each. Yes, I know it’s poor. I know I should have opted for a more interesting, more authentic dish rather than this greatest hits package and yet I always seem to do this in a Thai restaurant. It’s like the Quality Street of ordering – you know what you’re getting, there’s some variety, and you can always swap the culinary equivalent of the coffee cream (the Thai fish cake, in my case) with somebody else. Besides, it was only £5.50 a head, the same price as most single dishes on the starter menu. Actually, as it happened, this selection box had no coffee creams in it and my fish cake remained untraded. Normally I find them a bit floppy and tasteless but this one was very fragrant, lightly spiced and spongy rather than bland and flaccid. The prawns were unrealistically huge (split, I think) with a thick coating of breadcrumbs but they were tasty enough, especially once dipped in some sweet chilli sauce. The satay was proper chicken rather than something which had been “chopped and shaped” or (the horror) “formed” and the spring rolls were fabulous – proper fresh tasting shredded vegetables, including red and white cabbage, in a crispy layer of pastry. These in particular were the biggest hit of the selection – and I say that as someone who will often refuse to order a dish without meat in it. In hindsight, the Quality Street analogy maybe sold it a bit short. 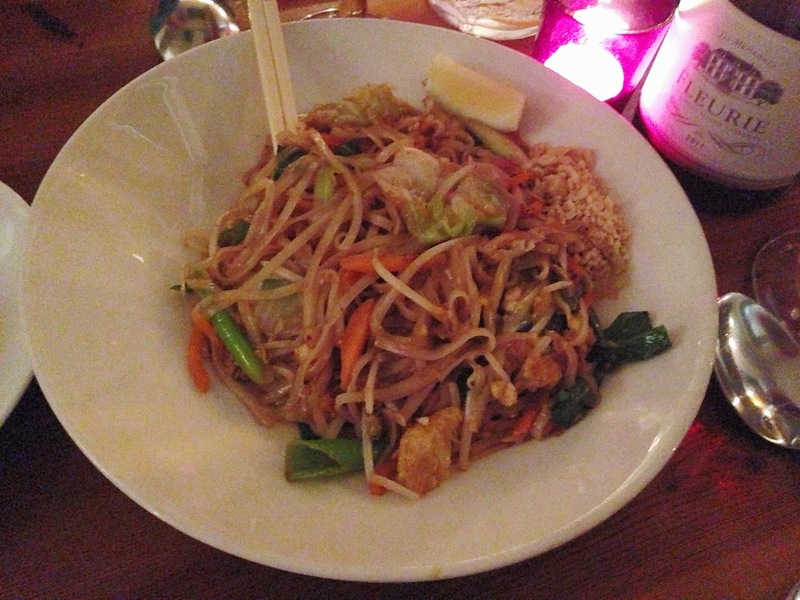 The Warwick does a lot of main courses – stir fries, curries, pad thai dishes and house specialities. There’s even a separate regional section, all of which have a three or four chilli rating – the menu rates all its dishes from “a little spicy” to “ouch! my mouth is on fire” or words to that effect, which I found so endearing that it almost made up for the use of Comic Sans. To compensate for the obvious choice of starters, we decided to steer clear of the usual massaman lamb or green thai curry and try something a bit more interesting. 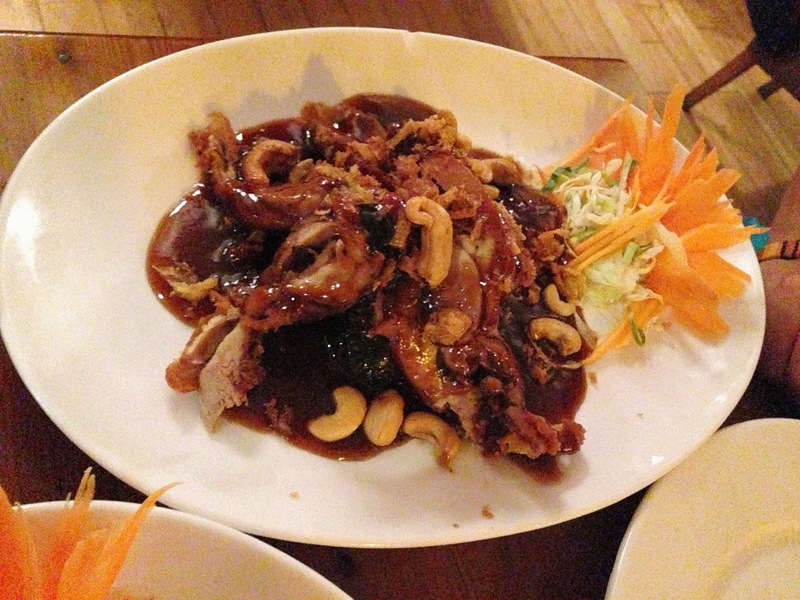 The ped makarm – crispy duck with sweet herbs and a sweet tamarind sauce – was a revelation. I rarely order duck in restaurants, because I’ve never been a fan of pink pan fried duck with that thick layer of wobbly fat on top. But there aren’t many pairs of words more beautiful than “crispy duck”, so I took the plunge. What’s not to like? This came on a little bed of broccoli (tasteless, but I think it was just there to prop up the duck) in a pool of rich, dark tamarind sauce with a few cashews sprinkled on top. And the gamble paid off, because it was magnificent. So many gambles in restaurants don’t – we all have experiences where you stray from your usual thing and are rewarded by a truly middling meal – but there’s something magical about picking something you wouldn’t normally order and having your socks knocked off. 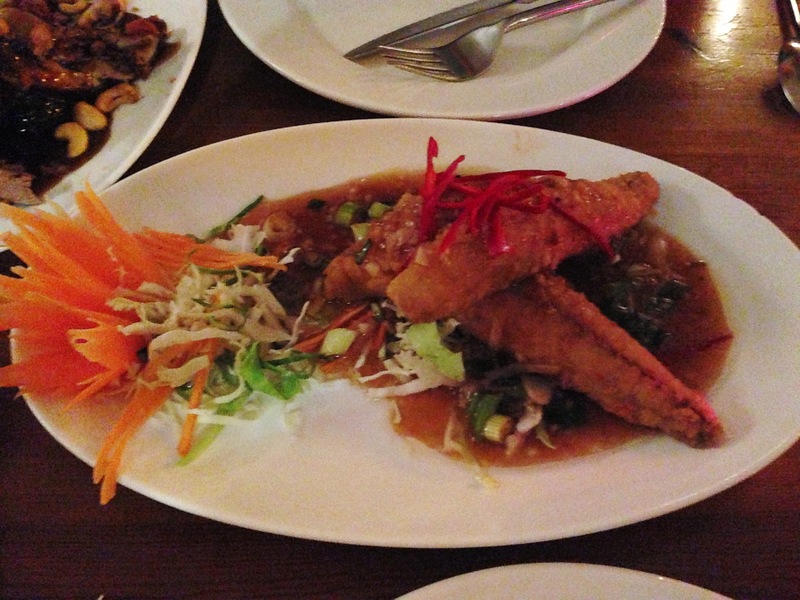 The other main dish was sea bass with stir fried garlic, coriander root and oyster sauce (kra tiem prig thai). Again, it was spot on. Two generous sea bass fillets, fried until crispy, skin and all, served with a rich sauce that honked of garlic (I pity the people at the desks next to us at work the following morning, put it that way). The only drawback, which I guess I should have appreciated, is that although you get a reasonable amount of sauce it’s never going to be quite as saucy as a Thai curry. The delicious bit at the end of a Thai meal, where all you’re left with is coconut rice soaked in rich sauce, was not to be a feature in our evening. The side dishes were good but not amazing, but they really weren’t the feature attraction, so it didn’t matter. Coconut rice was nice but unremarkable. The vegetarian pad thai, with cabbage and (yet more) tamarind sauce was better – fine noodles, tasty sauce and delicious cabbage, but it was a bit pricey at seven pounds. The Warwick doesn’t treat vegetarians all that well, I thought: the vegetarian dishes all hover around the seven pound mark (broccoli in oyster sauce for about seven pounds felt especially stiff). The mains we ordered were both £12.50, though there are plenty of dishes that are considerably cheaper than that. I’ve said the ambience is a tad romantic, but really this feels like a place to go with friends. They have a number of different set menus for two or more people giving you the opportunity to try loads of different things, and that’s what this kind of food should be about (they also do daily offers ranging from buy one get one free to a free bottle of house wine with some of their set menus). Even with just the two of us, it was one of those meals where you want your dining companion to taste your food, so they can do that nod and point thing where something you’ve picked is really good. As it was, there was lots of swapping and sharing, though I did have to put my foot down when I offered my companion an extra piece of duck and his fork hovered towards the super crispy shard of duck that I had been saving for the last mouthful (I’m nice but not that nice). And I was right to save it – so salty and crispy but offset by the sweet tamarind sauce. Yes, I know I’m repeating myself but there’s something about constructing the perfect final mouthful when you go out for dinner, and it was so, so good. We skipped dessert, partly because we had no room and partly because the dessert menu was pub food not Thai food – chocolate brownies, sticky toffee pudding and the like (although possibly preferable to the frozen delights you often get in Thai restaurants – who can forget the dubious pleasures of the “Funky Pie” at Thai Corner?). Instead we finished up the wine, got the bill – £69 for two courses and a bottle of half decent red – paid up and left. If it looks expensive, it probably is – it’s possible to eat a lot cheaper there, and based on what I had you’d probably eat very well. All in all, The Warwick is a mixed bag. You do feel like you’re eating somewhere that isn’t quite a pub, isn’t quite a restaurant. The furniture isn’t inviting. The service is a bit unpolished – probably partly because they were doing a brisk trade, even on a Wednesday night – but it did feel like a struggle at times. It’s on the edge of town, in a town that has a fair few other Thai restaurants (though not as many as it did before Thai Nine closed down). And yet, and yet… when I think back to that duck dish, it becomes an awfully hard place not to like. Even before I’d left a part of me was wondering what I’d choose next time, and that tells its own story. So I’d say go with friends, order carefully, don’t expect to be too comfortable (or if you are, don’t expect to get a good look at your food) and you should have a very enjoyable meal indeed. Oh, and probably best to stick to the beer.